This page shows the latest necitumumab news and features for those working in and with pharma, biotech and healthcare. 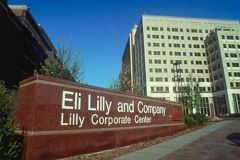 Stemming the decline in Alimta will give Lilly more time to build sales momentum for newer products such as rheumatoid arthritis treatment Olumiant (baricitinib) and NSCLC therapy Portrazza (necitumumab). The company has high hopes for oral rheumatoid arthritis candidate baricitinib - just filed in the US - and recently-approved NSCLC therapy Portrazza (necitumumab).